‘Post-truth’, Oxford Dictionary’s 2016 word of the year, appears to cover only the turn away from reason in contemporary politics. In fact the truth behind ‘post-truth’ is historically and philosophically more complex. As Fuller shows in this book, it reaches into the nature of knowledge itself. ‘Post-Truth’ was Oxford Dictionary’s 2016 word of the year. While the term was coined by its disparagers, especially in light of the Brexit and US Presidential campaigns, the roots of post-truth lie deep in the history of Western social and political theory. This book reaches back to Plato, ranges across theology and philosophy, and focuses on the Machiavellian tradition in classical sociology. The key figure here is Vilfredo Pareto, who offered the original modern account of post-truth in terms of the ‘circulation of elites’, whereby ‘lions’ and ‘foxes’ vie for power by accusing each other of illegitimacy, based on allegations of speaking falsely either about what they have done (lions) or what they will do (foxes). The defining feature of ‘post-truth’ is a strong distinction between appearance and reality which is never quite resolved, which means that the strongest appearance ends up passing for reality. The only question is whether more is gained by rapid changes in appearance (foxes) or by stabilizing one such appearance (lions). This book plays out what all this means for both politics and science. Post-truth should be seen as largely a continuation of the last forty years of postmodernism, especially in its deconstructive guise. Both postmodernism and post-truth publicly display a strong anti-authoritarian, democratic streak. Yet it is also a legacy rooted in Plato, who acknowledged an eternal power struggle – done in the name of ‘truth’ – between those who uphold adherence to the past and those who uphold openness to the future. Later, Machiavelli, and still later Vilfredo Pareto, described these two positions as ‘lions’ and ‘foxes’, respectively. Moreover, there has always been concern that if the struggle between the lions and foxes is made public, the social fabric will disintegrate altogether, as happened to Athens in Plato’s day. The ancient and medieval support for a ‘double truth’ doctrine (i.e. one for the elites and one for the masses), as carried over in modern conceptions of censorship, articulate these misgivings. In early twentieth century, Pareto based a general theory of society on this struggle. Pareto’s legacy left the most lasting impression in the US through the Harvard biochemist Lawrence Henderson. Henderson convened a ‘Pareto Circle’ in the late 1930s, which influenced the young Thomas Kuhn, author of the most influential account of science in the second half of the twentieth century, ‘The Structure of Scientific Revolutions’. What distinguishes science from politics is that in science the lions normally rule because they suppress contested features of their history until their own internal disagreements about how to interpret puzzling findings force a ‘crisis’ and finally ‘revolution’, during which the scientific foxes are briefly in control. 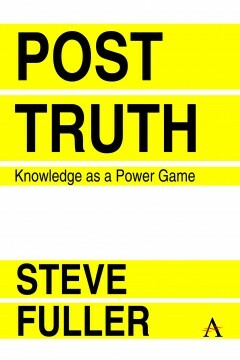 The book is concerned with the implications of a systematically post-truth perspective on academic knowledge production, which is largely seen as a vulnerable target. It turns out that military and industrial attitudes towards knowledge production have always embodied a post-truth perspective. The book also suggests an academic course of study for a post-truth world. The course would put less emphasis on content and more on skills, especially those involving the propagation and deconstruction of content, much of which is normally associated with marketing, public relations as well as aesthetic and literary criticism. In addition, the course would focus on arguments relating to the avoidance (lions) or acceptance (foxes) of risk. It would also examine the contrasting Orwellian practices involved in constructing canonical (lions) and revisionist (foxes) histories. The twentieth century interwar debate between Walter Lippmann (lion) and Edward Bernays (fox) over the meaning of a public philosophy in an era of mass media would be a centrepiece. Steve Fuller is the Auguste Comte Professor of Social Epistemology in the Department of Sociology at the University of Warwick, UK. Originally trained in history and philosophy of science, Fuller pioneered the field of ‘social epistemology’ in a quarterly journal that he founded in 1987 as well as in more than twenty books. His most recent books are Knowledge: The Philosophical Quest in History (2015) and The Academic Caesar (2016). Acknowledgements; Introduction: Science and Politics in a Post-Truth Era: Pareto's Hidden Hand; Chapter One: Brexit: Political Expertise Confronts the Will of the People; Chapter Two: What Philosophy Does and Does Not Teach Us about the Post-Truth Condition; Chapter Three: Sociology and Science and Technology Studies as Post-Truth Sciences; Chapter Four: The Post-Truth about Academia: Undiscovered Public Knowledge; Appendix: Prolegomena To A Deep History of 'Information Overload'; Chapter Five: Science Customisation: A Project for the Post-Truth Condition; Chapter Six: The Performance of Politics and Science on the Playing Field of Time; Chapter Seven: Forecasting: The Future as the Post-Truth Playground; The Argument in A Nutshell; Glossary; References; Index.